A massive 7.2 magnitude earthquake has struck off the east coast of Honshu, Japan according to the Japan Meteorological Agency prompting a tsunami alert. The quake reportedly occurred at 11:45 a.m. local time on Wednesday according to the U.S. Geological Survey (USGS). 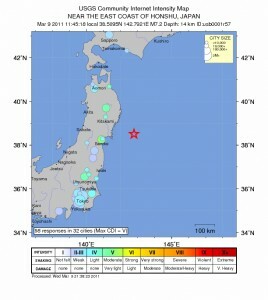 The epicenter of the quake was approximately 256 miles northeast of Tokyo, and according to the USGS, it was located 8.8 miles below the surface. 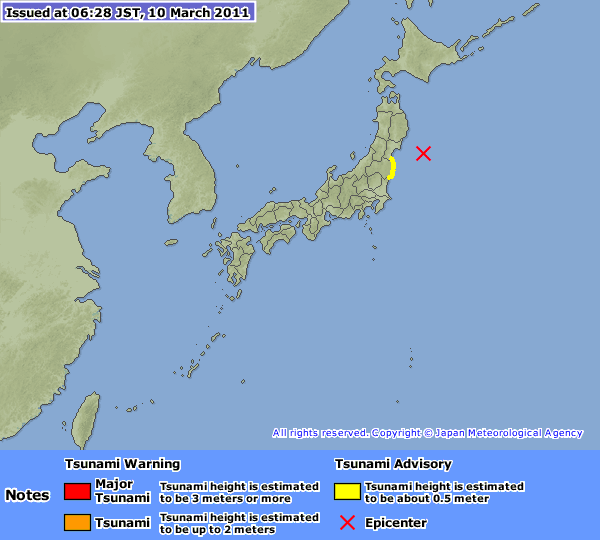 Japan's Meteorological Agency had issued a tsunami advisory for the Pacific Coast of Tohoku, in northeastern Japan, with an expected tsunami height of 0.5 of a meter (just over 1.5 feet). Coastal locations that felt strong tremors can also experience localized tsunamis due to underwater landslides. The 03/09/2011 earthquake near the east coast of Honshu, Japan, occurred as a result of thrust faulting on or near the subduction zone interface plate boundary between the Pacific and North American plates. At the latitude of this earthquake, the Pacific plate moves approximately westwards with respect to the North America plate at a velocity of 83 mm/yr. The Pacific plate thrusts underneath the North America plate at the Japan Trench, and dips to the west. The location, depth, and focal mechanism of the March 9 earthquake are consistent with the event having occurred as thrust faulting associated with subduction along this plate boundary.